One of the structures found in the mouth of most vertebrates which, in their most primitive form, were conical and were usually used for seizing, cutting up, or chewing food, or for all three of these purposes. 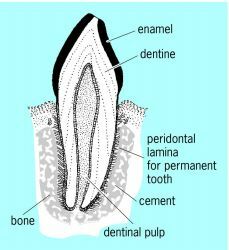 The basic tissues that make up the vertebrate tooth are enamel, dentin, cementum, and pulp (see illustration). Enamel is the hardest tissue in the body because of the very high concentration, about 96%, of mineral salts. The remaining 4% is water and organic matter. The enamel has no nerve supply, although it is nourished to a very slight degree from the dentin it surrounds. The fine, microscopic hexagonal rods (prisms) of apatite which make up the enamel are held together by a cementing substance. Dentin, a very bonelike tissue, makes up the bulk of a tooth, consisting of 70% of such inorganic material as calcium and phosphorus, and 30% of water and organic matter, principally collagen. The rich nerve supply makes dentin a highly sensitive tissue; this sensitivity serves no obvious physiological function. Cement is a calcified tissue, a type of modified bone less hard than dentin, which fastens the roots of teeth to the alveolus, the bony socket into which the tooth is implanted. A miscellaneous tissue, consisting of nerves, fibrous tissue, lymph, and blood vessels, known as the pulp, occupies the cavity of the tooth surrounded by dentin. The dentition of therian mammals, at least primitively, consists of four different kinds of teeth. The incisors (I) are usually used for nipping and grasping; the canines (C) serve for stabbing or piercing; the premolars (Pm) grasp, slice, or function as additional molars; and the molars (M) do the chewing, cutting, and grinding of the food. Primitively the placentals have 40 teeth and the marsupials 50. In therian mammals, probably because of the intricacies and vital importance of tooth occlusion, only part of the first (or “milk”) dentition is replaced. This second, or permanent, dentition is made up of incisors, canines, and premolars; as a rule only one premolar is replaced in marsupials. Although the molars erupt late in development and are permanent, that is, not replaced, they are part of the first, or deciduous, dentition. One of the hard bony structures supported by the jaws in mammals and by other bones of the mouth and pharynx in lower vertebrates serving principally for prehension and mastication. One of the regular projections on the edge or face of a gear wheel. An angular projection on a tool or other implement, such as a rake, saw, or comb. The coarse or abrasive quality of a paper or a painting ground that assists in the application of charcoal, pastels, or paint. A paper texture that holds ink more readily. Any of various sharp, horny, chitinous, or calcareous processes on or about any part of an invertebrate that functions like or resembles vertebrate jaws. 1. In a paint film, a fine texture imparted either by pigments or by the abrasives used in sanding; this texture provides a good base for the adhesion of a subsequent coat of paint. 3. any of the various small indentations occurring on the margin of a leaf, petal, etc.